This blog has on several occasions drawn attention to reports that show that Latin America is among the deadliest places to be a human rights defender [e.g. https://humanrightsdefenders.blog/2016/01/06/latin-america-philippines-most-dangerous-places-for-human-rights-defenders/]. 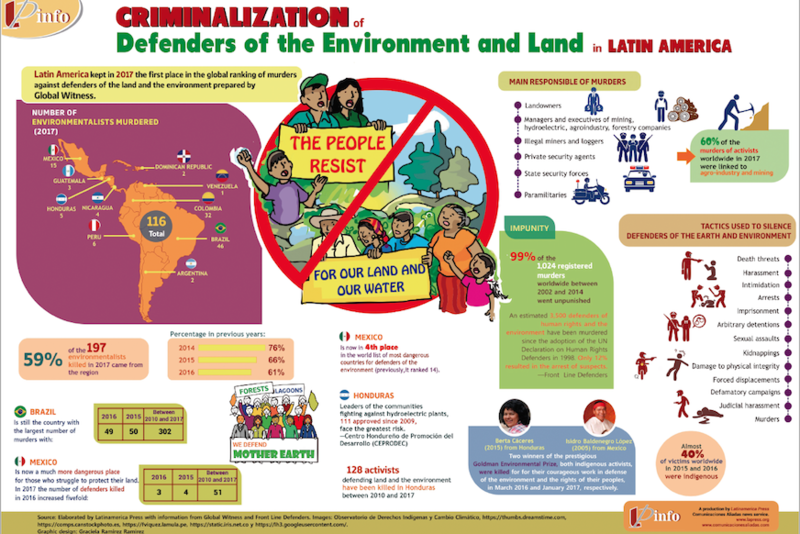 An infographic – published on 27 March 2018 by Latin America Press – summarises criminalization of land & environmental rights defenders in Latin America. The report, A Recipe for Criminalization: Defenders of the Environment, Territory and Land in Peru and Paraguay, outlined the three “ingredients” both countries use to undermine the efforts of human rights defenders. First, they delegitimize activists through smear campaigns. Second, they apply laws and regulations that allow for forced evictions. And, third, they misuse the criminal justice system to prosecute activists for unfounded reasons. “Those who bravely stand up to defend their land and the environment are frequently targeted because of their work. These attacks have a devastating impact on their physical, mental and emotional wellbeing, as well as that of their families and communities,” Amnesty International Americas director Erika Guevara-Rosas said in a press release. The report included examples of how these ingredients combine on the ground. For example, Amnesty International highlighted the case of community activists working to protect their home in Peru’s Cajamarca region from the gold and copper Conga mining project. On 26 April 2013, police arrested 16 protesters on trumped up charges of abduction and coercion. The state prosecutor sought 30-year prison sentences. But the evidence presented was secondhand and so spotty and contradictory that a court dismissed the case in 2017. On 24 April 2018, Front Line reported that on 19 April 2018, Olivia Arévalo Lomas, a woman human rights defender and spiritual leader of the Shipibo-Konibo indigenous peoples, was killed by unknown assailants just a few feet from her home in the community of ‘Victoria Gracia’, in Peru. The defender was shot in the chest and died instantly. Her body was left on the street in full view of her local community (https://www.frontlinedefenders.org/en/profile/olivia-arevalo). The killing of Olivia Arévalo Lomas comes after a spike in violence, threats and intimidation against members of FECONAU communities in Ucayalí, such as Santa Clara de Uchunya. In the past six months, several members of FECONAU have been subjects of attacks. A representative of FECONAU, Edinson Mahua, was shot at close range and narrowly escaped serious injury, while community leaders in Ucayalí have received anonymous death threats. In the meantime Colombia has seen a spike in assassinations of human rights defenders in 2018, according to study by Colombian NGO Somos Defensores. A total of 46 human rights leaders have been killed so far this year, up from 26 in the same period last year; paramilitary groups were responsible for three of the killings, four were murdered by guerrilla groups and another four were killed at the hands of security forces. The investigative body also recognized a total of 132 acts of aggression against public defenders so far this year. Of the registered acts, there were 12 attacks, 66 death threats and one case of forced disappearance. The provinces in which the aggression occurred were predominately in areas at the heart of the country’s conflict, with Cauca, Antioquia and Norte de Santander figuring heavily in the statistics. The UN has said it is “extremely concerned” about the increase in violence surrounding social leaders while Inspector General Fernando Carrillo has “urged” authorities to “assume their commitments to defend the lives of social leaders.” While the government has attempted to reel in the varying armed criminal groups responsible for a lot of these acts — as seen with the 2016 peace deal with the FARC guerrilla organisation, and ongoing peace negotiations with the ELN rebel group — it has clearly failed to provide basic security, and protect human rights defenders, rural community leaders and other social activists. This entry was posted on	April 28, 2018 at 17:31	and is filed under AI, Front Line, human rights, Human Rights Defenders. Thanks for report on Latin America fear Hans. It is increasingly becoming difficult to get inter continental HR reports. Also AI deserve applause for such work .